Watch your back, John K Samson! Oh it was a dog fight on Day 2 of Canada Reads. Two people voted against Rooms for Rent in the Outer Planets, two people voted against Cocksure. And then John K Samson's turn came up and he voted against Deafening. So there was a tie. And then the host, Bill Richardson, told JKS that he had to break the tie. What a tough position for a guy who has been trying hard (and successfully so far) to fly under the radar! He voted off Cocksure. 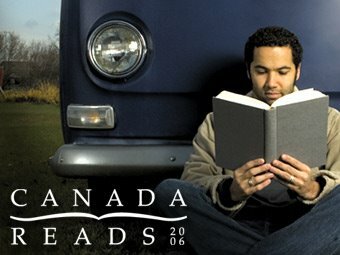 His rationale was that it is important that poetry is recognised as a legitimate part of Canada Reads. Oh and then the discussion got rather heated, with barbs flying about the nature of satire versus political correctness. Woof! And Scott Thompson got right snarky, as his book had been dropped so he's got nothing to lose. Not that he ever did. I have no problems with ultra violence, but I do have a problem with poetry. I am not a humour fascist! Oh and they printed my email on the Canada Reads website today. They probably print all of them. But the really weird thing is, they also printed the email of the woman from whom we bought our first house in London, Ontario in 1988. Two emails away from mine. wow, that's such a small world that her email is only one away from yours. I love when stuff like that happens, too cool amigo. It feels like some sort of cosmic balance is in play when stuff like that happens, Stephanie. I'd buy a lottery ticket right now if I didn't think they were stupid. buy a lottery ticket anyways Barbarella. Cuz I said so. Who knew a literary competition could be so stressful. BTW - I too love Case's take on "Wayfaring Stranger." Have you heard Jack White's? Kellee, so good to see you again! But when have I ever listened to anything anybody told me? I know, Will! Somebody is going or end up dead or maimed! I haven't heard Jack White's cover, but he does some other interesting ones (like Jolene). Is it good? It's nice to know that people read the sidebars. I must say, I AM enjoying the spice that Scott is adding to this year's debate. He was my least favourite Kid In The Hall, but now I can't remember why. John, Scott Thompson is certainly the most delightfully outrageous of the panel. Did you hear what he said about JKS today? HARHAR!! My money is still on the very very shrewd Icelander. You saw Kids in the Hall live, Barbara W? That must have been a blast! How could Scott's family possibly have been in denial about his being gay, I wonder? He is the most openly gay person I know of. Hey, That's my friend and favourite waiter, Charles, in the picture. The fellow reading the book, Sookie? No way! Well Charles is getting pretty famous - I'm seeing him on a few blogs. I'll be by to visit yours. Melissa, I think the National Playlist was only supposed to run for a set period of time. And then of course, they had to make room for the previously scheduled Canada Reads. I miss NP though, and the day's just not the same without Jian. Or better yet, Jian and George sharing a man-hug.